Benefits of an internet based over a VSAT based online education. A virtual classroom allows learners to attend a class from anywhere in the world and aims to provide a learning experience that is similar to a real classroom. Various components of a Virtual classroom enhance and enrich the classroom activities technically. Synchronous learning connects students and professors and interacts with each other in real time. Professors can share their audio and video thus establishing one-to-one relation with the students. Moreover, students asking questions can share their videos with the fellow students as well. The entire classroom can be recorded in video format and stored in a library for future references. The resource sharing in the virtual classroom allows professors to share contents with students in real time. Why do I need a virtual classroom? A virtual classroom allows both learners and instructors around the world to participate in live classes to collaborate and interact. A low-cost virtual classroom is considered to a major advantage as the participants can also save time since all that is needed is an internet connection. Online learning is also equipped with advanced technologies which allow the same traditional or real-time classes to be conducted far more convenience and tools. The content of a virtually held class session can be easily shared and accessed among the participants of the classrooms. In this way, both school and individuals can find a lot of tech tools and services to boost their educational efforts in a virtual classroom setup which can be exploited to catalyze the teaching and learning process. Who needs a virtual classroom? As there are so many possibilities to choose from, a virtual classroom makes it far more intuitive than traditional classes for teachers to teach online classes. Organizations which are involved in teaching online courses with no face to face classroom elements may share video lectures online. In addition to video lectures; hosting live chats can also prove to be a way to involve participants and make the learning process a lot more dynamic. Sharing interactive learning activities encourages active participation in the learning process by ensuring the virtual classroom which includes interactive learning and revision activities. Not only is this beneficial for students as they can keep track of how much they are learning. It can massively reduce the workload of the tutors. 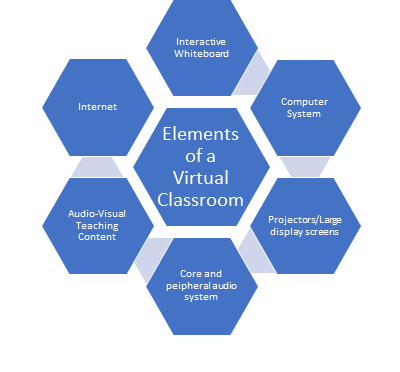 Where can I buy a Virtual Classroom? After designing and deciding over a classroom one can have a deep dive into the online market of virtual classroom instruments required. One can go for purchasing individual items for their classroom setups or collectively on a turnkey basis. Due to the ever-increasing market of online commodities almost all the hardware and software components of a Virtual classroom setup can easily and conveniently be procured from these online platforms. Although, if you are not so prudent and acquainted with the technology, you can consult an industry expert and get you classroom designed and installed. A number of suppliers are available who offer consultation and supplies right from the beginning of the planning and till the execution. To avail such a consultation, you can write to us at info@eassessment.in. Please note that our consultation is free of cost and from the best experts in the industry. How are Virtual Classrooms changing the education system around the world? With the advent of the virtual classroom, one is not required to be physically present in the classroom. It has nowadays become necessary especially with those seeking cheaper education facilities. Such a classroom allows both learners and instructors around the world to participate in live classes to collaborate and interact. The global e-learning market has reached approximately $ 107 billion at the end of 2015 which roughly grew by 13% by the end of 2017. The rates of virtual learning adapters are quite significant with leaders being India, China, and Malaysia. Electronic education has seen a steady growth which only seen to get more significant as time passes by. If the statistics are any indication, then the future of virtual classrooms will only play a bigger role in the education sector. ← Benefits of an internet based over a VSAT based online education.